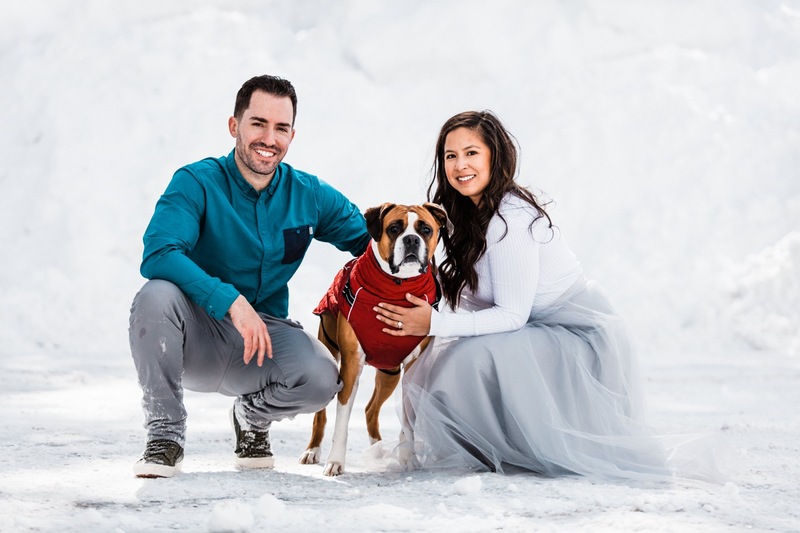 If bright blue skies set against a wintry backdrop of white snow isn’t enough to make you fall in love, Ryan and Nina absolutely will. 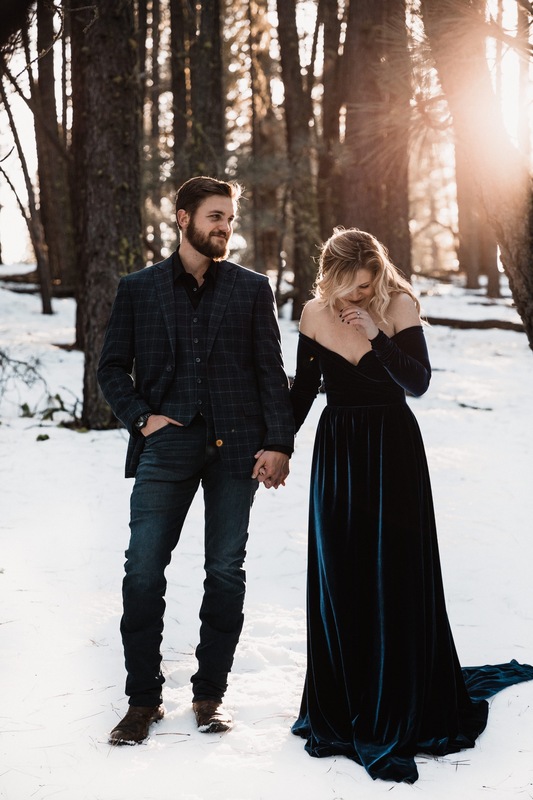 We met this sweet couple in February to take their engagement photos on the trails in South Lake Tahoe, but we almost had to cancel because of all of the (massive amounts) snow! Thankfully, as the sun started to peek out, we decided it was worth it to brave the snow - and Ryan and Nina agreed! The couple, who met six years ago on a company softball team, got engaged at Lover’s Point in Pacific Grove near Monterey, California. 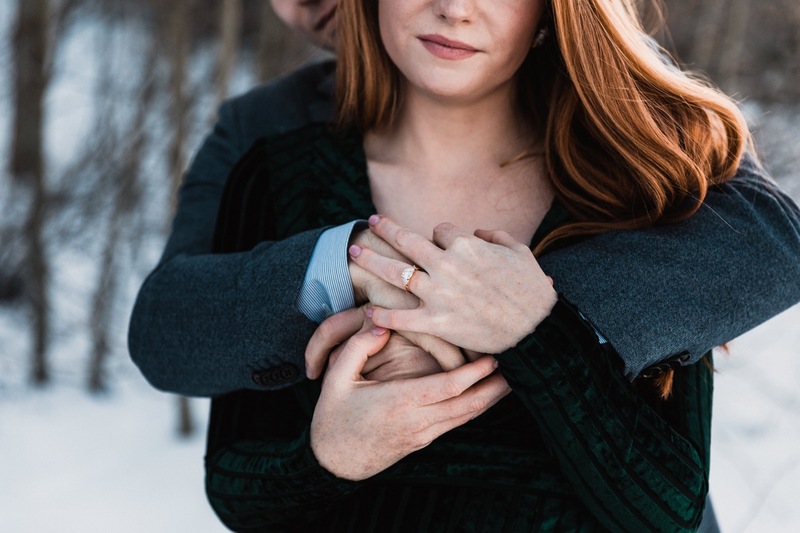 Planning an outdoor fall wedding, the couple is (thankfully) adventurous, which means they didn’t hesitate to trek out into the deep snow with us in order to capture some seriously gorgeous shots. Although we all fell deep into the snow at some point or another (sometimes all the way up to our hips! ), we knew that since this was just a mini session (only 30 minutes) we were all going to be okay. The couple dressed perfectly for the day - his bright shirt popping against the fresh snow and her gorgeous skirt (which she made herself!) being the perfect amount of statement-making formal you want for such a special occasion. Even Ryan and Nina’s dog joined in on the action (and wore the cutest red doggie sweater). We loved meeting this fun couple and are so glad they were up for a snowy hike! 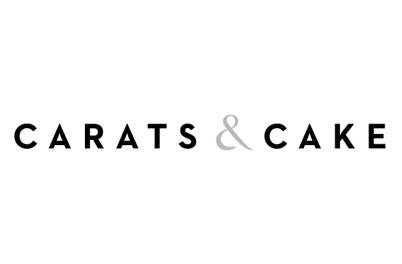 To say we love our work is an understatement; we’re seriously obsessed with what we do. Not only do we get to spend time adventuring outdoors, but we also get to meet super cool couples in the process. Case in point: Jess and Rio. The two native Californians, who plan on tying the knot this April (we’ll be photographing that too! ), met over six years ago and both agree that it really was love at first sight. Looking for creative photographers who love the outdoors as much as they do, it was a great fit for all of us. 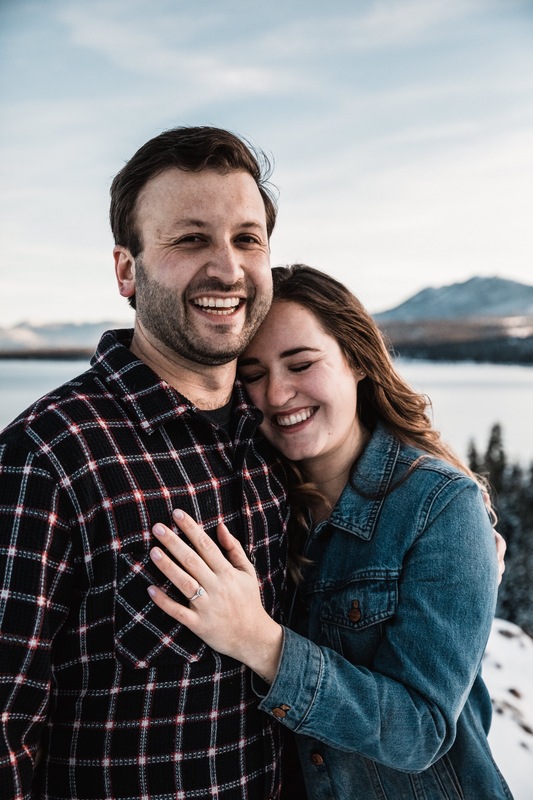 We ventured to Chalet View Lodge for the engagement session, the couple packing a few outfit changes so that we could capture all of the vibes they wanted. (Jess went from a weekend casual sweater to a gorgeous off-the-shoulder velvet gown to a cozy cardigan + boots.) Because the couple stayed at the property for the weekend, they had gotten familiar with a few of the places they wanted to have photos before we even got there. Together, we explored the gorgeous mountain property, enjoying the fresh snow on the ground and strolling on a picturesque riverbank. The towering trees helped to filter the sunlight as it started to set - a cool effect especially with all of the natural textures we came across. The couple really allowed their personality to come through as we worked, which made the day even more enjoyable!